Now that the temperatures are warming up in Minnesota, we’ll be seeing a lot more of the unwelcome stinging insects that appear every spring and summer. Wasps and hornets tend to pose the biggest problems of all the various stinging insects, and once they invade your property, they can be difficult and dangerous to eradicate. If you have wasps or hornets that have taken up residence near your home, then you are well aware that they are not simply a nuisance, these stingers also pose a threat to your safety. When you’re faced with the threat of these dangerous pests, rely on the experts at Eco Tech to safely and properly exterminate wasps and hornets from your Blaine MN property. 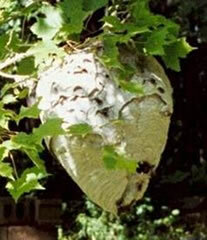 When you spot a wasp or hornet nest on your Blaine MN property, you may be inclined to respect nature and “live and let live”. But if you’re noticing more and more wasps or hornets flying too close to your personal space for your comfort, then it is time to consider removing the nest. Can I Remove A Hornet or Wasp Nest Myself? The main reason that hornets and wasps are not welcome near or in homes is because they are aggressive and may sting repeatedly without even being provoked. Once a nest is disturbed, wasps and hornets can become very irritated, which makes attempting to remove these nests yourself very dangerous. Do-it-yourselfers are urged to wear protective equipment such as a bee hat, gloves, and coveralls, and to spray the wasp or hornet nest at night, when most of the workers and queen are present. However, it is not recommended that you shine a light onto the nest at night in order to see where you’re spraying, which can be lead to it being difficult to see exactly what you’re doing! Additionally, when you attempt to spray a hornet or wasp nest, be careful that you do not stand where spray can drip onto you, or any plants or trees that you would want to protect. After all is said and done, our professional extermination services are just as affordable and many times more effective. With over 15 years of experience working with insect extermination and removal in Blaine, the experts at Eco Tech are knowledgeable in the safe removal of wasp and hornet nests that are on or near your home and property. Call us today at 763-785-1414 for 24/7 emergency service, or for an affordable quote for your pest extermination in Blaine MN, which can also include pest damage repair and our recommendation on preventive measures for your home.